22 km north of Toulon. Take N97 road to Sollies-Ville then the D554. 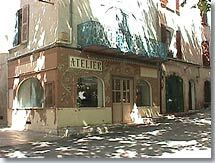 Belgentier is a charming little village that sits astride the river Gapeau. 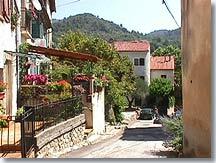 It is surrounded by a chain of hills planted with olive trees, pines and oaks that encase the village in greenery. 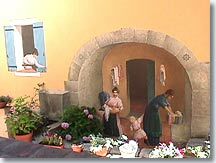 As you arrive in the village, you cannot help but notice the trompe l'oeil fresco painted on the back of the church in the square. This pleasantly shady square enlivened by some shops and cafés is where everything happens. Here the village old-timers sit around wearing their caps, chatting and watching the cars go by. As you walk around Belgentier, you will discover some fine narrow cobbled streets, linked by roofed and vaulted passageways. The old houses with their sculpted stone door frames bring out the charm of this little village. You can feel here that residents are always seeking to make their village more beautiful. The window boxes are packed with flowers, the colours of shutters and house fronts are harmonious, the whole of the old village is really most charming. . The hills around Belgentier protect and shelter the village against the cold winter winds, and also help keep it cool in the summer. It is no doubt thanks to these verdant "wind-breaks" that Belgentier's figs and cherries are renowned far and wide , and together with olives they continue to constitute the village's main agricultural resources. The village square. 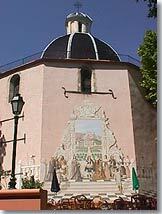 Notre Dame de L'Assomption. The Park of Chateau Peiresc. 2 campgrounds, (one is nudist). Sollies-Pont (7 km), Sollies-Toucas (5 km) and Méounes les Montrieux (6 km).